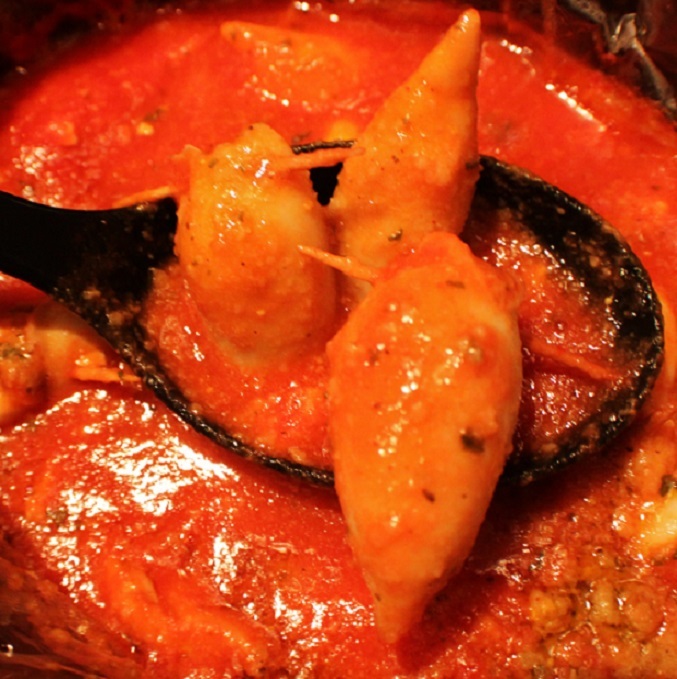 Stuffed Squid (Calamari) In Tomato Sauce is an Italian traditional meal served on Christmas Eve and one of the 7 fishes served on our Italian tables. We enjoy this traditional seafood banquet and absolutely love this gourmet treats during the holiday. I am truly blessed to have a family that kept the traditions from generation to generation and my children will do the same. A real tradition in my family every Christmas Eve. Mom, from Bari, use to prepare this that night, dad would be so impatient as it was his favorite. Another one of those dishes, when I was a small child I would shun away from. Now, I only wish I could go back in time knowing the art it was to watch her make this so perfect, tender and delectable as she did, then to learn exactly what she put in hers. After many years of trying to master her recipe, I finally got a taste that brought tears in my eyes to have a part of her in our home for this holiday season. After all, Christmas Eve is a time for family to be close, making memories for their kids to pass on, this one will be it for me. I have had her recipes that say ingredients on index cards for years now, there were never amounts written down, until now. Couple that with even more traditions with the Christmas Eve vigil of awaiting the arrival of Gesu Bambino then add in the Italian fondness for turning any occasion into a reason for cooking and eating in and you have the Feast of the Seven Fishes on the table. This is a memorable treat for me, some of my family remembers Mom's stuffed calamari for every Christmas Eve, my kids will now learn our many years of traditional 7 fishes and this dish will now be added with love! Another one of those dishes, when I was a small child I would shun away from. Now, I only wish I could go back in time knowing the art it was to watch her make this so perfect, tender and delectable as she did, then to learn exactly what she put in hers. These traditions has its roots in Southern Italy and owes its origins in part to the Roman Catholic practice of abstaining from meat on certain days of the week. It's funny how as we grow older, how much more you think and relive those traditions we remembered as a child, as it becomes more important as an adult. The story behind this when I was a kid was I was scared to death on the octopus when mom would bring it home. I would actually hide. I would get teased by everyone. As a kid I never understood this was something that was going to be transformed into a delicious delicacy. I saw it as a strange sea creature. Honestly I think I was only around 5 years old then. Of course as the years went on I got use to it, grew out of the fear and because a huge fan of stuffed squid. I even helped make the stuffing with mom before she passed and watched intently. Now that I have grandchildren I will be making this when they come over at Christmas to see if they react the same way as their grandmother did when she was little. I will be looking to see if they have that look of fear as I am cleaning it. They're too young right now, I will update you in a few years! Family always had nick names for foods. My brothers called them torpedo's. I guess they do look like them. That was the nickname that we grew up with and they still call them that now. It really makes me smile to think back on how simple things were back then and of course times change but the traditions live on. We hold on to the wonderful memories we grew up with, that makes the holiday so much more important to carry these traditions mom and dad had. All cleaned and ready to be stuffed. These are really easy to stuff. Just take some stuffing and force it in with your index finger. I secure them with toothpicks. Really if you buy the tubes already cleaned there really isn't much to do other than rinse them off really good. The sauce over the pasta is the best flavor. It slow simmers and the squid is super soft and easy to cut with a fork. A lot of folks think their rubbery but they are soft and delicious tender. Very flavorful. The sauce is in a light marinara sauce and she used fresh plum tomatoes. A tradition every year here and many Italian homes at Christmas. I find this dish to be a real delicacy as you can't find it on many menu's if you do you hit the jackpot! 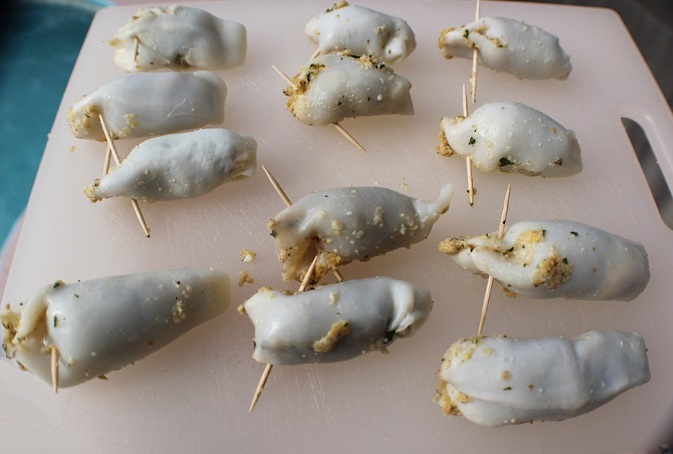 This is a traditional meal for an Italian family on Christmas Eve call Stuffed Squid. It is served over pasta in a rich tomato sauce. In a medium size bowl mix bread crumbs with all seasonings. On the side of the squid opening cut a small slit to open the tops wider. Stuff the squid using your fingers to get down to the end of the squid being careful not to rip them open at the bottoms and leave expanding space at the tops. After filling all the squid, secure the tops of each one with tooth picks. I like to brown mine first before adding to the pot of sauce. I saute them in olive oil with some minced garlic until browned. (You don't have to do this step if you don't want to.) I then drop them into a 5 quart pot of tomato sauce and cook for three hours on low or more until the squid is soft and tender. At least 1 hour and 30 minutes, sometimes longer depending on how soft they are, you need to test them. Serve the squid over linguine, percatelli, or your favorite pasta. The word calamari is the plural form of the Italian word for squid, Calamaro. It's calamar in Spanish. The name derives from the Latin word calamarium for "ink pot. "Since calamari seems to sound more palatable than the word squid, you will most often see squid recipes listed as calamari on restaurant menus, recipes, etc. It's one of those words that just "sounds better" or "has class," according to some people. Whether you eat calamari or squid, you're eating the same thing. I love how your family has these traditional dishes that you so generously share with your readers. I would love to come to your house and learn how to prepare them with you. When I went to Italy I fell in love with the food and people, but when I got home I only had books to learn from. Everybody needs an Italian mom/grandma to learn from, if you want to make the best food. Books don't teach the tricks, tips and love that moms do. Because you take the time to share many of us can learn from a real Italian mom. Thanks Claudia! And I am glad to see that Curt and Gino realize what a treasure you are and are in the kitchen learning from you as well. I knew this had to be one of your dishes for Christmas Eve. We'd always have oyster stew growing up, but I'd welcome 6 more seafood options! What a coincidence, I made calamari just a while ago for lunch but I just floured them and fried them. Yours is so much more delicious! Thank you for the recipe. Wow, this sounds awesome! I love squid (Calamari). I'll bet this is fantastic stuffed. Claudia, I've never made squid, let alone stuffed it. This has to be very time consuming and an art for such little bitty pieces. I'm sure these taste fantastic. You're a talented chef! I've never had them stuffed (love that your brothers called them torpedoes!). What an endearing, delicious recipe! There's a lot of love going into that dish - and isn't that why we cook? These look delicious and I can see where patience is needed. The only calamari I've had is breaded and fried but it's like a pretty tasteless rubber to me. This on the other hand seems like a dish I could really like. 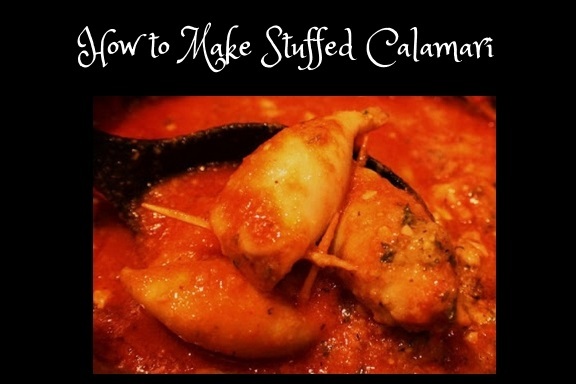 I've always shied away from making calamari, but I will certainly try this! Happy Holidays! I do not now, nor will I ever eat squid, but this is how my mom liked to prepare it. I remember her using "colorful" language when she stuffed it, so I know how much patience it took for you to produce these. Thanks for the memories. I absolutely adore calamari and this is such a wonderful way to enjoy it!! Oh my gosh Claudia the word patience is an understatement!!! I like to bake mine in tomato sauce. Eggs are the difference in our family recipes. This is a very time consuming dish and one I won't be serving this year. Fabulous dish and tradition friend. Wishing you and yours a blessed and beautiful Christmas. Wow, that looks great! It sees you have certainly mastered the art of stuffing them! 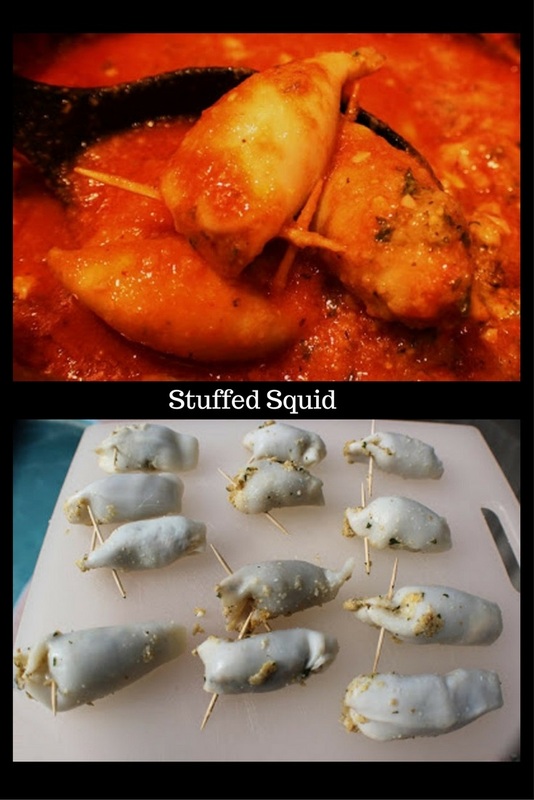 Got to make these for my family..you know i am not huge fan of squid, but would totally try it!!!! Very interesting. I do love calamari - but only know the battered, deep fried rings and the "little animals" (which I don't like). Don't get squid too often but this is a wonderful recipe; I can see why your dad loved it so much. You can't beat a good homemade tomato sauce. What a wonderful and delicious Christmas eve memory. Such a delicious looking dish, I do love calamari. They look fab!! 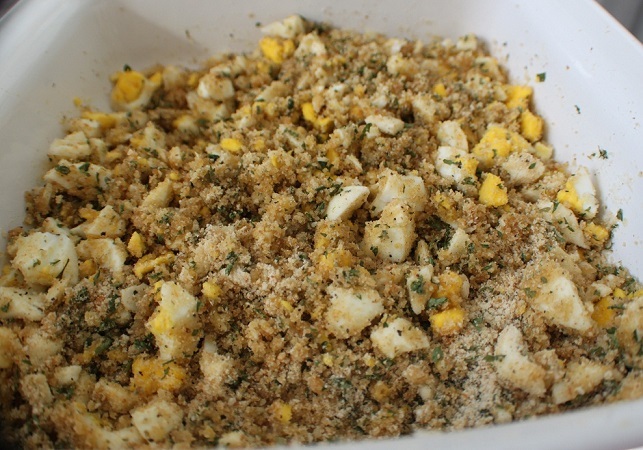 Love how you have mastered the method of stuffing. I have never had this before but it totally looks like something I would love. Great recipe Claudia! This is a great seafood recipe to serve at the dinner table this Christmas! Looks delicious!